American rabbi; born at Amsterdam, Holland, Nov. 13, 1852. He was educated at the Jewish Theological Seminary of Amsterdam, and received the degree of D.D. from the Hebrew Union College, Cincinnati, O. He has officiated as rabbi at Philadelphia (1873-76), Washington, D. C. (1876-77), Providence, R. I. (1877-78), Houston, Tex. (1878-86), and, since 1886, at the Temple Emanu-El, San Francisco, Cal. In 1894 he was appointed professor of Semitic languages and literature at the University of California, which office he still holds (1905); he officiates also as chaplain and special lecturer at the Leland Stanford, Jr., University. 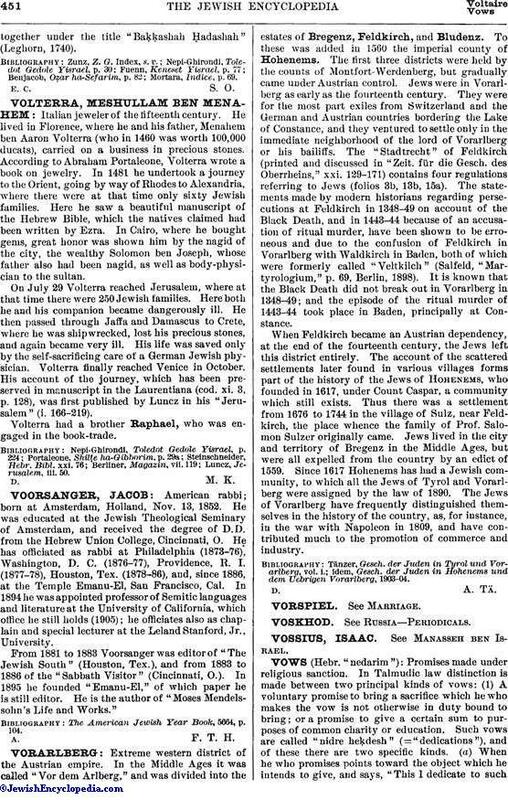 From 1881 to 1883 Voorsanger was editor of "The Jewish South" (Houston, Tex. ), and from 1883 to 1886 of the "Sabbath Visitor" (Cincinnati, O.). In 1895 he founded "Emanu-El," of which paper he is still editor. He is the author of "Moses Mendelssohn's Life and Works." The American Jewish Year Book, 5664, p. 104.